This is always better to read books by the same author must be chronological order. I did the other way round. The first book I read was Love is Vodka and then Chapter 11. His first impression was that of a person who writes chick-lit and can write a girl’s character with such élan that you would doubt that the writer might be a female. Chapter 11 is his second book and he has already famous for his debut book, Flight to the Hilsa, about a woman artist. He has indeed learned to portray his woman characters. In his book, Chapter 11, the protagonist is a male and he is looking to broaden his horizons. He is done with his old job and his home town where everyone seems to know him. He joins a Fortune 500 Company which is in Gurgaon. From the time when he has stayed in Delhi during his college days to now, it is all different. 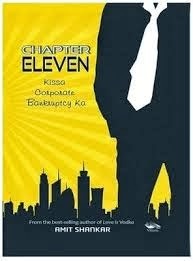 Disaster happens when his company files for bankruptcy or Chapter 11. He has no idea what to do and how to behave. He is idealistic in nature but his bosses and his mentor isn’t. He has to choose between the two. The novel revolves around the concept of molarity and also how much the world has changed over the time. Coming back to the novel, it is a narrated well. The prologue makes for an interesting read and piques the interest of the reader. The questions of faithfulness, loyalty and above all greed are answered and how important they are in a corporate culture. Does the fast life means that we skip past our morality and live a life of a person who has no values. relatable and the way the protagonist deals in his life is very close to reality. We all want big houses, cars and dreams also very big. The quandary is if we can do anything for those dreams or humanity is much more important than that. Amit Shankar asks some hard hitting questions with his book. Whether it is his introspection or ours, one thing is for sure, Chapter 11 is swift, racy and a total package.